Patrick J. Rooney | Fafinski Mark & Johnson, P.A. Pat has a highly-successful commercial litigation/trial practice representing clients throughout the country. His approach, regardless of the size of the case, is simple: provide focused, smart, aggressive representation aimed at achieving the client’s goals in the quickest, most cost-efficient manner possible. With Pat, the client always comes first. In the 30+ years, he has been practicing Pat has represented virtually every type of client—from Fortune 50 companies and large, privately—held corporations, to individuals and single-owner LLCs. 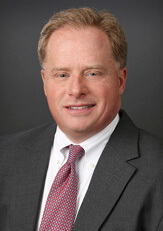 His cases have run the gamut, from shareholder and employee matters concerning contract disputes, non-competition agreements, and discrimination, to high-stakes, bet-the-company commercial claims involving allegations of misappropriation of trade secrets, trademark, copyright and patent infringement, products liability, fraud, and breach of fiduciary duty. He has appeared and is licensed to practice in the state courts in Minnesota, Wisconsin, and Massachusetts, and has first-chaired cases in the United States District Courts in Minnesota, Wisconsin, Massachusetts, Iowa, Colorado, Michigan, Delaware, New York and others. He has also briefed and/or argued numerous cases before the Minnesota Court of Appeals, the Minnesota Supreme Court, and the 8th Circuit Court of Appeals. In conjunction with his litigation practice, since 2001 Pat has served on the board for The Fund for the Legal Aid Society, an organization whose primary task is to raise money to support The Legal Aid Society of Minneapolis. Pat has been named a top lawyer in Minnesota in the area of business litigation and has been selected by his peers as a Super Lawyer every year since 2001 – a distinction received by less than 5% of the lawyers in Minnesota. Groschopf v. Northern Tool & Equipment Catalog Company, Inc., — F. Supp. — (E.D. Wis. 2014), Federal District Court, Eastern District of Wisconsin (12/4/14); Obtained summary judgment dismissal of all claims in a $19 million products liability case arising out of an exploding target product sold by defendant. Miller v. Elliott Aviation Aircraft Sales, Inc., 4:13-cv-161, Federal District Court, Southern District of Iowa (12/10/14); Obtained a stipulation of dismissal of all claims on behalf of defendant with no monetary payment to plaintiff in a multi-million dollar claim alleging fraudulent misrepresentation, violation of the Iowa Consumer Fraud Act, rescission, and breach of express warranty arising out of the sale of a used $2.9 million Hawker Beechcraft Jet Aircraft. Local Government Property Insurance Fund v. OPS America, Inc., 13-cv-648, Wisconsin Circuit Court, Waukesha County (6/27/14); Obtained a stipulation of dismissal of all claims on behalf of importer-defendant with no monetary payment to plaintiff in a substantial fire case involving an allegedly defective industrial fan. Daniel Ehrmann v. Leslie Adam, et al., A08-2120 (Unpublished Opinion), Minnesota Court of Appeals (09/01/09); Dismissal of plaintiff’s defamation lawsuit based on comments made by attorney during settlement discussions upheld. Powell v. Anderson, A05-734 (Unpublished Opinion), Minnesota Court of Appeals (01/10/06); terms of a shareholder agreement signed by a minority shareholder in closely held corporation presumed to reflect the parties’ reasonable expectations, and the court is bound to follow it unless minority shareholder establishes price of terms are unreasonable under all the circumstances of the case. Bolander v. Bolander, 703 N.W.2d 529 (Minn. App. 2005); the existence of a renewed or extended contract for services, after the expiration of the term specified in the parties’ written contract, may be established by the preponderance of the evidence; where president of a closely held company admits to actions not in the best interests of the company, some form of equitable relief under Minnesota Statutes is required. Nelson Design Group. L.L.C. v. Scoville Press. Inc., A04-1603 (Unpublished Opinion); Minnesota Court of Appeals (06/21/05); summary judgment for defendant inappropriate if plaintiff able to raise even minimal fact issue concerning material issue of fact. Crenlo, Inc. v. Austin-Romtech, A03-851 (Unpublished Opinion), Minnesota Court of Appeals (05/04/04); summary judgment in breach of contract claim not appropriate if there are factual disputes regarding what was bargained for and received as part of the contract. In re Estate and Trust of Walter G. Anderson, 654 N.W.2d 682 (Minn. App. 2002); decision of district court denying petitioner’s claim to remove trustee has preclusive to subsequent petition challenging final accounting on all issues decided in first matter; when a will, stock-redemption agreement and trust form part of the same estate plan, they must be construed together when ascertaining the settlor’s intent. Raines v. Sony Corporation of America, 523 N.W.2d 495 (Minn. App. 1995); trial court erred in submitting case to jury on theory of res ipsa loquitur when evidence would sustain other theories of causation. Fire Insurance Exchange v. Adamson Motors, 514 N.W.2d 807 (Minn. App. 1994); proper calculation of prejudgment interest is established; party not obligated to advise opponent prior to trial of opponent’s witnesses’ perjury conviction and trial court did not err in not granting a continuance when witness failed to appear to testify. Rennick v. Minnegasco, et al., C5-90-917 (Unpublished Opinion), Minnesota Court of Appeals (11/20/90); absent notice of a problem, prior owner of real estate is not liable for injury to purchaser or third party caused by the condition of the premises existing at the time the purchaser took possession. Pat lives with his wife, Laura, and their yellow Labrador retriever in the western suburbs of Minneapolis. Pat is a season ticket-holder for the University of Minnesota Gopher football team. He also enjoys baseball, movies, reading and traveling with his family.